In Laura van Dernoot Lipsky’s book (2009), Trauma Stewardship: An Everyday Guide to Caring for Self While Caring for Others, she identifies a transformation that occurs when one is regularly exposed to trauma. This response often occurs without any awareness that it is happening. For those of us called to steward the trauma of God’s children we must be diligent in taking care of ourselves so that we can continue to be of use to him and his purposes. I can’t help but feel this is that case in youth ministry as well. How often have you even felt that what you are doing is never enough? How often do we feel helpless and hopeless, like we are not even putting a dent in the enemy’s influence? How often do we feel exhausted as we move from one crisis to another? For those of us in the trenches it can feel like a never-ending onslaught day after day. 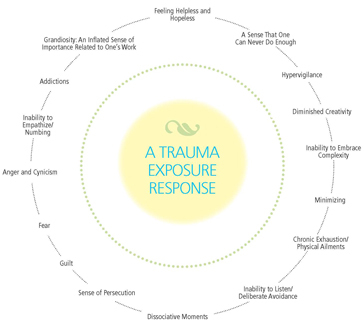 The image below show signs that you may be experiencing secondary trauma or compassion fatigue. Take a moment and ask God to search your heart and see if he might speak to you about this issue. If, after hearing from God, you believe you are experiencing one or many of these symptoms then take some time to let God heal those places in your heart. We are beginning a new blog series focusing on taking care of yourself while you serve in the trenches called “Youth Ministry Survival Guide”. You will see these rolled out over the next few months. In the meantime, if you are struggling with the grind and consequences of ministry and you serve in some of those dark places where trauma lives, we want to invite you to reach out to Simply Soul Care. Simply Soul Care is a safe place for youth workers to be encouraged, prayed for, and loved on by veteran youth workers who are gifted and called to serve those in the trenches. You can use Soul Care by visiting the Soul Care website. If you are planning on going to the Simply Youth Ministry Conference this year you can also stop by The Shelter and schedule an appointment with one of our Soul Care Advocates. This is a one-on-one appointment where you will meet with someone who will listen to you, pray for you, and encourage you. I have had the privilege of serving in the ministry for the last couple of years and have seen God work in the lives of those who serve him in powerful ways. The work you do is important but so are you. Make some time to let someone pour into you the way you pour yourself out to others. This keeps you in the game and that’s a win-win for everyone.